Apolis, online at store.apolisglobal.com, is the destination for quality men's clothing and accessories. Apolis carries jackets, sweaters, shirts, tees, bags, pants, denim, footwear, luggage, accessories, and more. Stop by RetailSteal.com for the latest Apolis coupon codes and discount codes. Apolis also offers shipping promos that change often. Visit RetailSteal.com for the latest Apolis shipping specials. Enjoy 10% savings with email sign up at Apolis. Shop online at Apolis and enjoy up to 40% off sale items. Save up to 25% on bundles at Apolis. 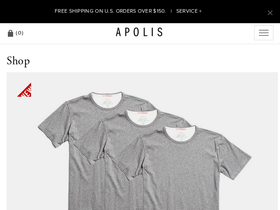 Enjoy free shipping on orders $150+ at Apolis. Shop at Apolis and enjoy a free co-op roast with orders $300+. Enjoy exclusive promos with email sign up at Apolis.